Fulham winger Ryan Sessegnon has been named the Championship Player of the Season at the EFL Awards. The 17-year-old has scored 14 goals in 43 league appearances for his side, who are third in the table. Blackburn midfielder Bradley Dack, 24, and Accrington striker Billy Kee, 27, won the League One and League Two awards respectively in London. Sessegnon was also named Young Player of the Season and Championship Apprentice of the Year. Earlier in April, the teenager became the first player from outside of the top flight to be nominated for the PFA Young Player of the Year award, and he made his debut for England Under-21s against Ukraine in March. Fulham are third in the Championship, one point off the automatic promotion places, but have played one game more than second-placed Cardiff. 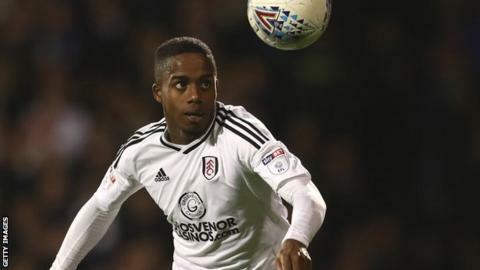 "I just want to play in the Premier League with Fulham," Sessegnon said. "We are on an incredible run this season and I want to continue that and hopefully we can push into the Premier League. "Hopefully we can do it automatic but if not then we will do our best in the play-offs." Sessegnon beat team-mate Tom Cairney, 27, and Wolves midfielder Ruben Neves to win the Championship Player of the Season award. Portugal international Neves, 21, has scored six times in 39 outings for Wolves, who were promoted to the Premier League on Saturday. Neves was included in the EFL Team of the Season alongside team-mates John Ruddy and Conor Coady, as well as Sessegnon. The 2017-18 EFL Team of the Season, managed by Accrington's John Coleman; John Ruddy (Wolves), Nathan Byrne (Wigan), Conor Coady (Wolves), Charlie Mulgrew (Blackburn), Ryan Sessegnon (Fulham), James Maddison (Norwich), Ruben Neves (Wolves), Bradley Dack (Blackburn), Bobby Reid (Bristol City), Billy Kee (Accrington), Adebayo Akinfenwa (Wycombe). BBC football commentator John Motson, who is retiring from broadcasting at the end of the season, won the Contribution to League Football award, recognising his service to the professional game. The 72-year-old is in his 50th consecutive year with the corporation, and has covered 10 World Cups, 10 European Championships, 29 FA Cup finals and more than 200 England games. Former Bristol Rovers and Southampton striker Rickie Lambert picked up the Sir Tom Finney award. The honour, named after former England and Preston North End forward Finney, is presented to a player who has had an exceptional EFL career. Lambert, 36, scored 218 goals in 607 league appearances over an 18-year career that saw him play for nine different clubs, seven of which were in the EFL.